Histone methyltransferase. Preferentially methylates 'Lys-4' and 'Lys-27' of histone H3. H3 'Lys-4' methylation represents a specific tag for epigenetic transcriptional activation, while 'Lys-27' is a mark for transcriptional repression. 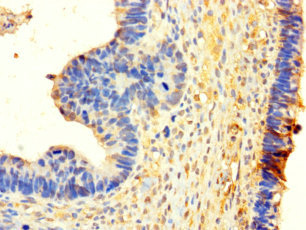 WHSC1L1 Polyclonal Antibody. Unconjugated. Raised in: Rabbit.